I had a whole day to myself in Verona! How to make the best use of it? I really wanted to explore areas I did not know well and decided to plot my route using the HopOn HopOff bus. This service is often the best way to explore and here it was ideal as I could get it from the main station. The information on the bus was good and I did a full circuit on both routes. Having noted the main points of interest relating to Venetian Verona and Austrian Verona as I had already explored Roman and Medieval Verona. I set off from Piazza Bra, in the centre of the city. I walked to Porta Nuova, a significant addition to the defences of Verona while it was part of the Republic of Venice (known as la Serenissima Repubblica). Joining this republic in 1405 brought stability to Verona. A stability that lasted until the end of the eighteenth century when Napoleon claimed the city. During this period – that coincided with the Renaissance – the Veronese architect Michele Sanmicheli was entrusted with the task of re-building the defences of the town. 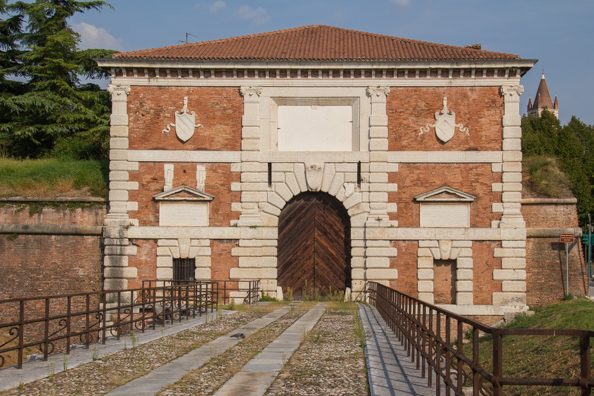 The imposing Porta Nuova was the main entrance through the new walls. The grassy area that tops the walls is now a park, Parco del Mura, that links the different gates. It was a pleasant walk to the next gate, Porta Palio. This gate, built between 1542 and 1557 is one of the most important architectural works of Michele Sanmicheli. Initially it was used solely for military purposes. 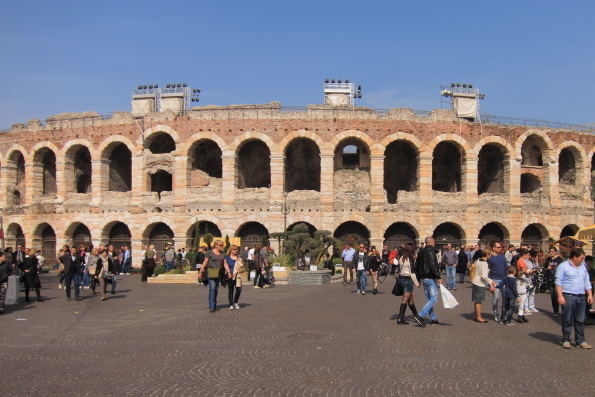 When it became the starting point for the Verona Palio it it became known by its current name. The palio is contested both on foot and horseback. It was first held in 1208 and it is the world’s oldest running event. It was run every year until the end of the eighteenth century. Dante Alighieri, Italy’s great poet, referred to this event as the Race of the Green Cloth. The winner of both races receives a green cloth. The consolation prize had more substance – a leg of pork. The race on foot was revived in 2008 and a green cloth is still awarded to the fastest man and the fastest woman. 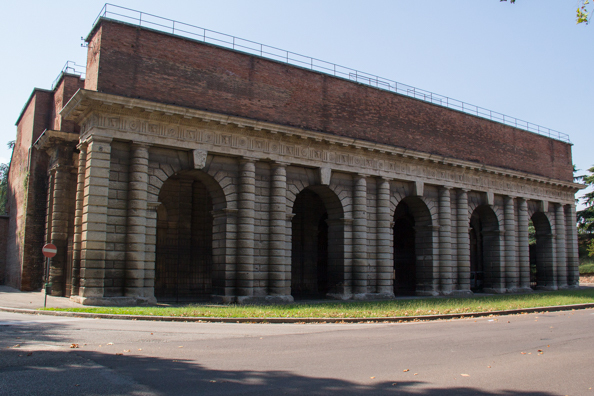 Porta San Zeno is the third of Michele Sanmicheli’s imposing entrances into the city. Still attached to the city walls on one side it is the most attractive of the three gates. It was once the guard’s house. Now it is the headquarters of the Committee for the Bacanal Gnoco. This committee organizes of the celebrations for the Verona Carnival. This annual Easter event has taken place since 1531. It is one of the oldest carnivals in Italy. Close to this gate is the Church of San Zeno. 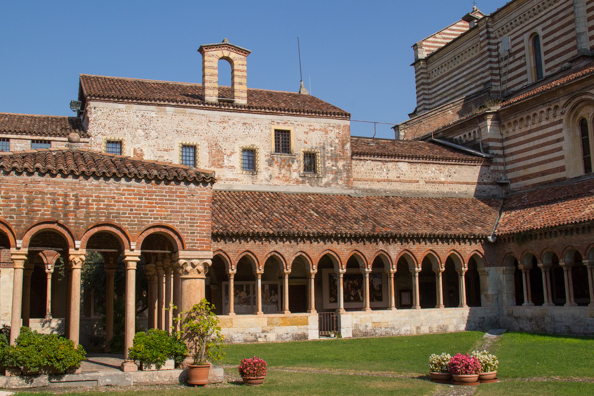 It was founded in the fifth century to house the relics of the patron saint of Verona, San Zeno. The church was later rebuilt and enlarged with the addition of a monastery. This monastery survived until it was dissolved by the Republic of Venice in 1770 and the basilica became a parish church in 1806. Particularly impressive are the magnificent bronze doors that date from the twelfth century. Piazza Erbe, one of my favourite places in the city, features a market and a line of restaurants down one side. 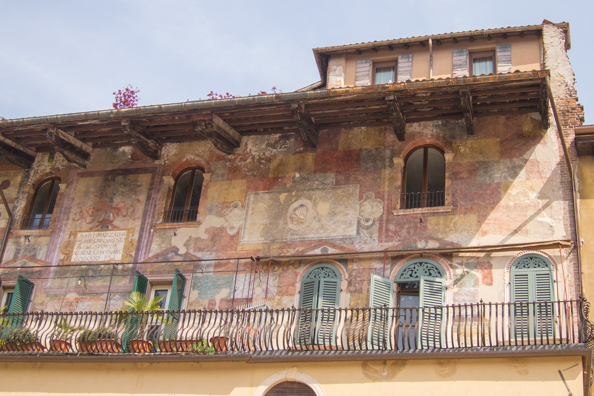 It is ringed by beautifully frescoed buildings including the Mazzanti Houses. These houses once belonged to the della Scala family and were to store wheat. When they were acquired by the Mazzanti family at the beginning of the sixteenth century the exteriors were painted, following a current fashion. 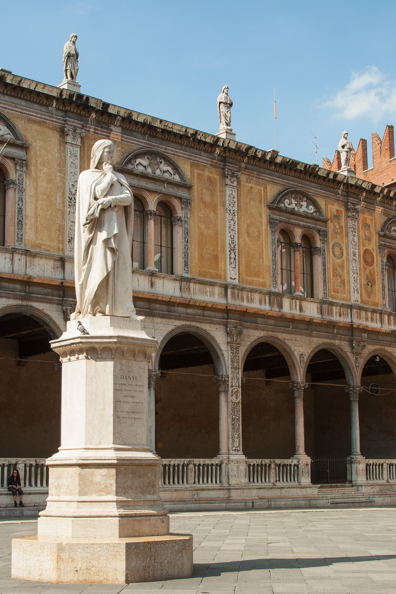 One of the most attractive Renaissance palaces in Verona is in Piazza dei Signori. 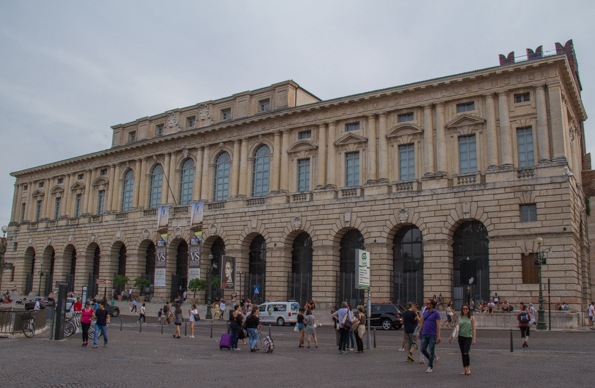 The Loggia del Consiglio has a stunning façade and statues of Vitruvius, Catallus, Pliny the elder, Marcus Aurelius and Cornelius Nepos adorn its roof. 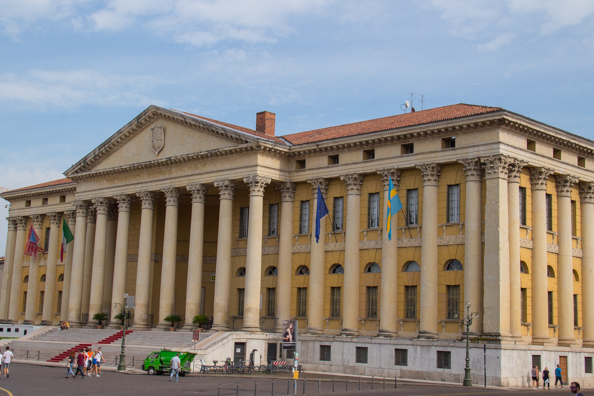 It houses the Provincial Administration and is rarely open to the public. Back in Piazza Bra my attention was drawn to the Palazzo della Gran Guardia. As the name suggests (grand guard) this building was designed for military purposes. In bad weather the troops could be reviewed beneath the building’s wide porch. Building, in the baroque style, commenced in the first half of the seventeenth century. The work was interrupted due to a shortage of funds and it was finally completed two centuries later in 1836. Recently restored the palazzo is now an important venue for exhibitions, cultural affairs and other events. After Napoleon took Verona at the end of the Eighteenth century there followed a period of strife between the French and the Austrians. Following the defeat of Napoleon Verona was given to the Austrians at the Congress of Vienna in 1815. It remained part of the Austro-Hungarian Empire until it joined the newly formed Republic of Italy in 1866. The architects from Vienna took inspiration from the different styles of Verona and some of their buildings blended perfectly with the existing architecture. In Piazza Bra the Palazzo Barbieri is a good example. Built between 1836 and 1848 this elegant, yellow building was originally constructed to house the soldiers of the Civil Guard Corps. During its construction the piazza was cleaned up and the level was lowered exposing the underground sections of its Roman amphitheatre, the Arena. Palazzo Barbieri was designed by the engineer Giuseppe Barbieri in a style reminiscent of the great architect Andrea Palladio. It has two wings decorated with large half Corinthian columns. This building is now the Town Hall and most of the rooms are used for administrative purposes. Other buildings constructed during this period did not blend in so well. The Austrians had coveted Verona due to its strategic position. They turned it into a fortress town and made it the capital of their Italian territory. They created extra walls, gates and fortresses. One of these fortresses is the Castel San Pietro. It was built on the left bank the River Adige. Napoleon christened this area Veronetta or little Verona by with the intention of belittling its inhabitants after it had been ceded to the Austrians. The Austrian castle was built in 1851 on the site of the original Castel San Pietro, built by Giangeleazzo Visconti in 1398. That castle was blown up by the French in 1801. This building has been owned by the City of Verona since 1932. It is not currently open to the public due to its dilapidated state. The terrace in front of the castle overlooks the town below is popular with both locals and visitors. The Arsenale Austriaco is on the same side of the river. 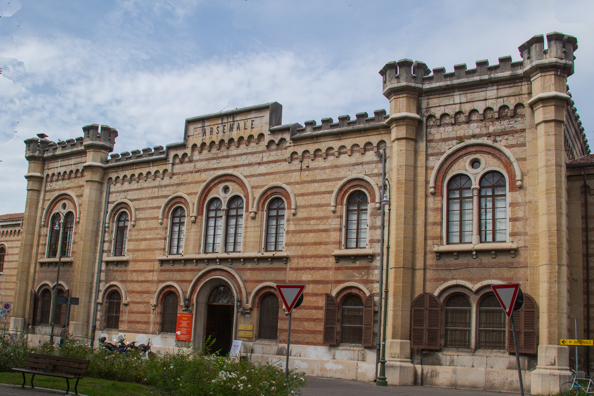 This large ex-military complex is fronted by an imposing building that was built by the Austrians between 1854 and 1861 and dedicated to the Emperor Franz Joseph I. Most of the single-story buildings surrounding the large grass-covered courtyard beyond the archway through the main building are empty and boarded up. Except one. 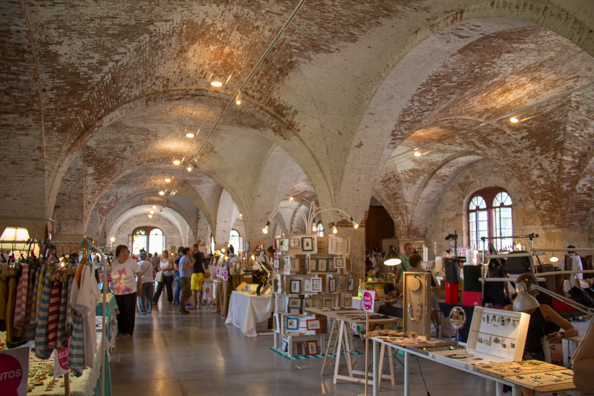 It was the venue for a handicrafts fair. I went inside curious to see what it was like. Despite its shabby appearance it is ideal for this and similar events. Enclosed by a wall the Arsenale comprises nine buildings separated by courtyards and squares and all linked by internal roads. 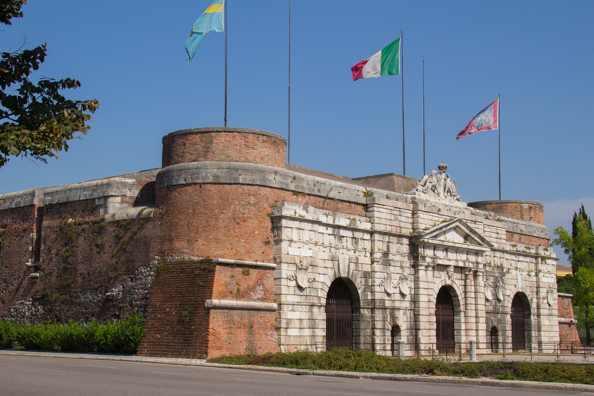 When Verona became part of the Kingdom of Italy in 1866 the Arsenale continued to be used for military purposes. 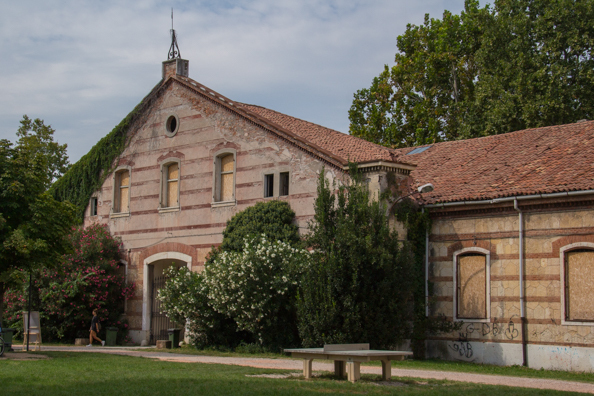 But after it became the property of the Municipality of Verona part of it was turned into a public park and the rest was abandoned. I ended the day by taking the Hop-on Hop-off sightseeing bus to the top of Saint Leonardo Hill to visit the old Fort San Leonardo. 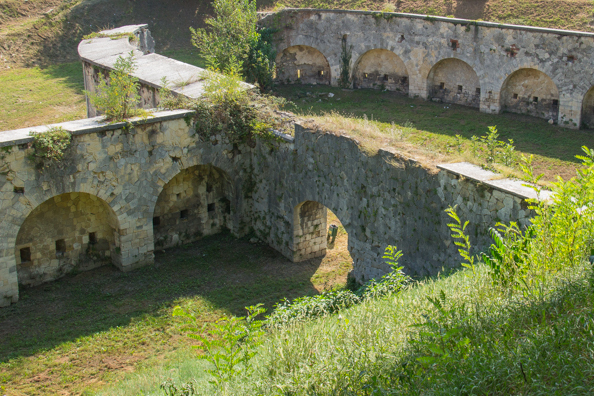 The Austrians built this fort on the site of the Shrine of Our Lady of Lourdes in 1838. It was damaged during the Second World War and in 1952 it was given back to the church. 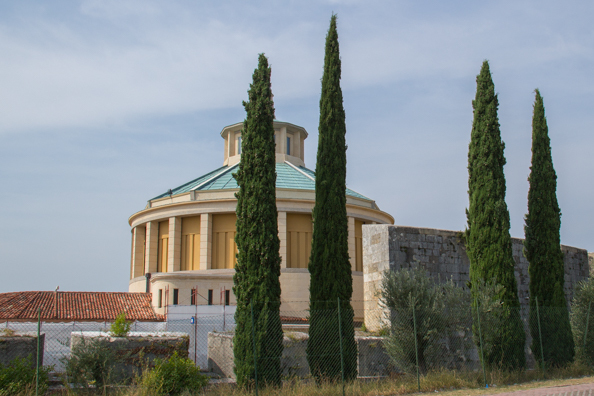 Since then it has been rebuilt as the Church of Our Lady of Lourdes incorporating some features of the old fort. Behind the church is a statue of Our Lady of Lourdes which miraculously survived the war intact. 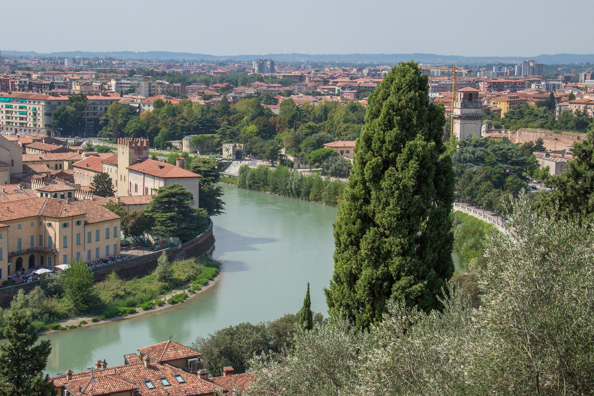 It had been a great day during which I completed my exploration of the four foundations of Verona. Wow, so much I had no idea about concering the history of Verona! Thanks for your very knowledgeable article, I will save this as a guide for my upcoming travel to the city. Thanks for taking the time to comment. I am glad you found the article useful. Have a great Christmas and all the best for the New year. THIS ARTICLE IS VERY EXPLANATORY & COMMUNICATIVE. THANKS, FOR THIS INTERESTING & INFORMATIVE ARTICLE. Thanks for your comments. I have just read your article on National Parks in India – I have spent some time in both Banhavgarh and Ranthambore and would love to go back to both.